I held the sea snake for two seconds, long enough for my husband to take his picture. You can see how worried I look behind my diving mask. But truly it’s really very hard to be bitten by a sea snake. I’d have to put my finger down the snake’s throat – and I’m not THAT crazy. 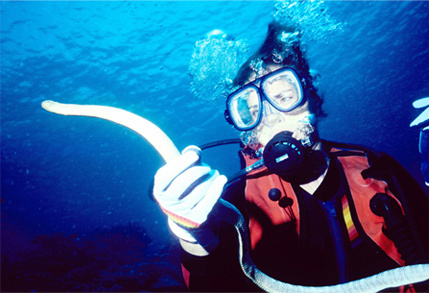 My profession isn’t studying sea snakes. Writing books is my job. I’ve written 55 books for children and four books of poetry for adults. I also do collage art. My absolutely best and favorite thing to do is meeting the children, their teachers and the librarians when I visit schools. I’m happy that you’re visiting my web site. Please go to Growing Up to begin the story of my life. Visit Special News for announcements and updates!